More than 35 political scientists representing nine community colleges and universities in the Houston metropolitan area gathered on the Rice campus March 22 for the Peer-to-Peer Pedagogical Partnership (P4), a pilot program of the American Political Science Association designed to bring together local political science professors to develop teaching materials to be used in American and state politics courses. “What you’re doing is really innovative and really, really important,” said Rogers Smith, president of APSA and the Christopher H. Browne Distinguished Professor of Political Science at the University of Pennsylvania, during remarks to open the event. 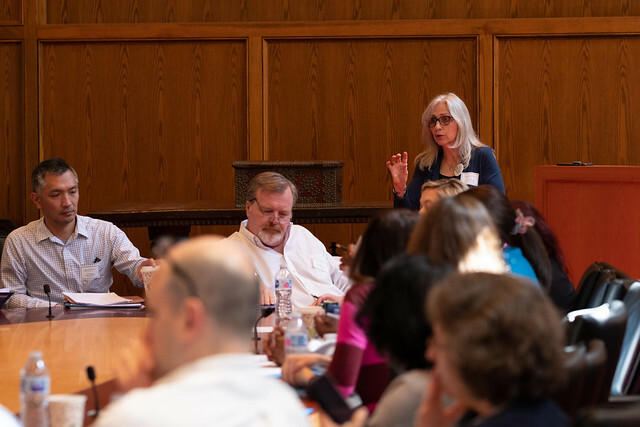 Throughout the day, political scientists in attendance offered presentations relating to race, ethnicity, gender, student engagement and translation of academic articles and political science concepts. This was followed by breakout sessions and reports from these gatherings. The goal of the collaboration is to produce supplementary course materials presenting cutting-edge research on race, ethnicity and gender in U.S. and Texas politics that will be available for use by all Houston-area higher education instructors. Ashley Leeds, chair of the Rice Political Science Department, was one of the organizers of the event, which she hopes will not only be a model for future political science events in other cities but also an additional way Rice can engage with the Houston community. For more information on the American Political Science Association, visit https://www.apsanet.org/.